Recently updated your kitchen? You’re not alone. Kitchen remodeling jobs represented a whopping 79% of all remodels in 2015. Once you’ve had your kitchen cabinets refinished or remodeled, it’s important to keep them sparkling clean. Keep reading for the best routine to add to your regular cleaning schedule. Take care of these daily fixes to maintain the longevity of your cabinets. Here’s your new rule to live by. The moment you notice a splatter on your kitchen cabinets, you’re going to clean it up. Whether it’s pasta sauce from a messy kid or oil from sauteeing vegetables, take care of it. Immediately. It may not be the most fun chore in the world, but if you do it on a regular basis, it will reduce build-up. And, it will make them easier to maintain. Even if nobody can actually see the mess behind your cabinet doors, do yourself a favor. Keep your dishes clean and organized. It’ll make the internal cleaning process that much easier. And, if you’re going to invest in beautiful cabinets, keep them beautiful. There are several household products available for cleaning your wood cabinets. Each of these works well for cleaning, and they are all affordable options. If you have tough, caked-on dirt, consider making a small baking soda paste and scrub it out with a cotton swab or old toothbrush. Any of the solutions above will work as well. The most important factor to keep in mind with metal cabinets is avoiding rust. That means you want to make sure that you are cleaning up any water or liquids immediately. Any of the solutions above will also work well. In a pinch, you can also use all-purpose cleaning products or sprays. Skip the baking soda on these kitchen cabinets, however. Since paint requires more gentle cleaning and care than wood, this product is too harsh. If you notice any dents or chips in the paint, be sure to go over them with a small paintbrush and matching paint. Many of these are quick fixes that you can take care of on your own. Annual deep cleaning helps preserve the longevity of your home, and it can actually be therapeutic for you (trust us on this!). Once a year, completely empty out your cabinets and wipe down all the internal shelves. This is your opportunity to parse through any dishes or miscellaneous items and de-clutter. It can be a laborious task, but it’s worth it. Your beautiful, organized cabinets will thank you. 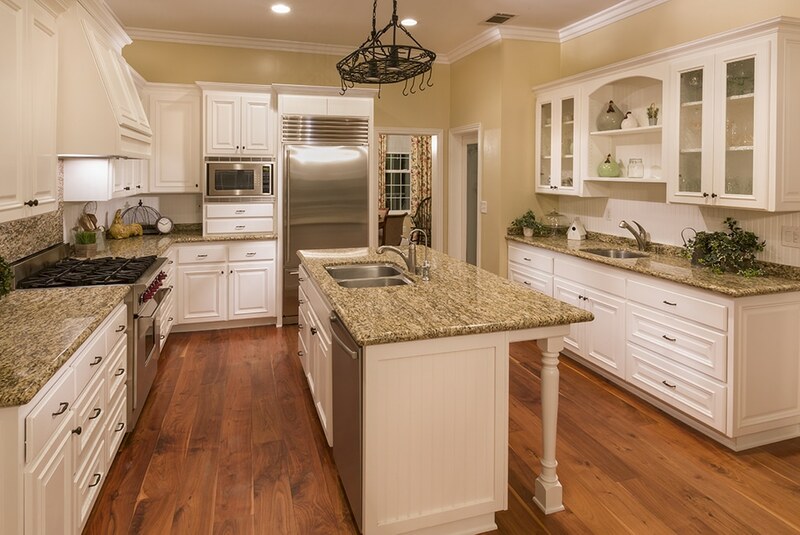 At America West Homes, we believe the kitchen is the cornerstone of any home. If you’re in the St. Louis area and ready to make your kitchen dreams come true, contact us for a free consultation.